The CBC's Greg Weston tries to decipher what Prime Minister Stephen Harper means when he talks about "a strictly non-combat mission" for Canadian troops in Afghanistan. The afternoon of Nov. 3, a chartered jetliner took off from Quebec City on a historic flight of sorts, its 145 passengers were the first of the last Canadian troops heading off on this country's final combat mission in Afghanistan. Prime Minister Stephen Harper confirmed late Wednesday that his government is rethinking its clear undertaking to bring Canadian troops home from Afghanistan — for good — in 2011. Instead, the Harper government now wants to extend Canada's military presence by another three years to 2014, maintaining a force of up to 1,000 soldiers and support personnel in "non-combat training roles." As the prime minister said Wednesday: "I haven't made a secret of the fact that I'd like to see all of our troops come home. "That said, as we look at the facts on the ground, I think the reality is, there does need to be some additional training of Afghan forces. So, we are looking at some training options for a smaller number of Canadian troops, but this would be a strictly non-combat mission." The idea seems to be that Canada would reduce its current deployment of about 2,700 troops in Afghanistan to roughly 750 military "trainers" and another 250 military support staff. That's a far cry from the "strictly civilian mission" that Harper was promising less than a year ago. In theory, the trainers would train members of the Afghan army and police in classrooms and protected bases away from any actual combat zones. In other words, the Harper government is trying to paint a picture of Canadian troops staying in Afghanistan three years longer than expected but doing things where no one gets hurt. In practice, the Harper plan may simply lead to three more years of Canadian troops dying in combat disguised as training. Canada's former top soldier, for one, dismisses the whole idea of trying to train Afghan soldiers safely away from actual combat zones. In a recent interview with Maclean's magazine, retired general Rick Hillier said: "You can come up with all kinds of schemes to hide away in camp and train people for the Afghan army, but they lack credibility. "If you try to help train and develop the Afghan army … you are going to be in combat." There are also serious questions about what 1,000 more Canadian military trainers would be doing in Afghanistan, particularly if they will be confined to safe areas, or "behind the wire." 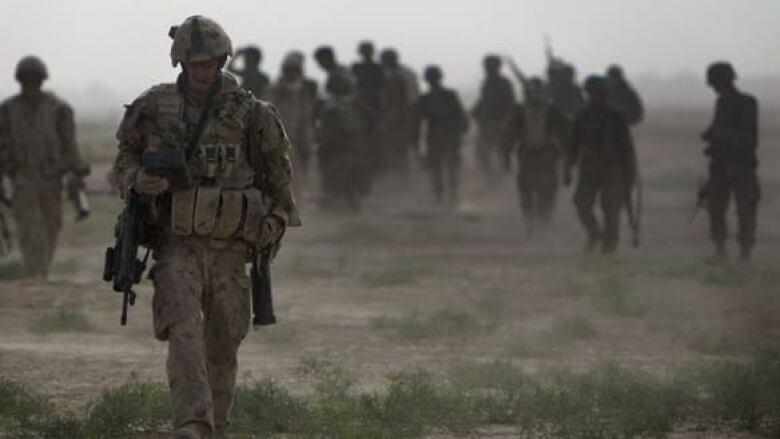 According to the Department of National Defence, 325 of the 2,750 Canadian military personnel in Afghanistan are currently engaged in "instructing, training and mentoring" members of the Afghan army and police. The department won't say exactly where all the "training and mentoring" of Afghans is happening. But it does acknowledge that fewer than 125 Canadian soldiers are assigned to various training centres, headquarters and other relatively safe areas. The vast majority are on special teams training Afghan soldiers in the field, outside the wire, in combat zones littered with lethal roadside bombs. In fact, among all the NATO countries, Canada is currently one of the largest contributors to in-combat field training for the Afghan army. So, what does the Harper government's plan really mean? The number of Canadian military personnel involved in classroom training would increase from fewer than 125 to perhaps 1,000, while Canada's currently onerous contribution to actual in-field combat training would be eliminated. But NATO documents indicate the alliance only needs another 750 trainers from among the entire 42 countries with forces in Afghanistan. The vast majority of those trainers would be involved potentially in live combat. Less than a year ago, the prime minister was clear: "We will continue to maintain humanitarian and development missions, as well as important diplomatic activity in Afghanistan," he said in a January interview with CanWest News. "But we will not be undertaking any activities that require any kind of military presence, other than the odd guard guarding an embassy. We will not be undertaking any kind activity that requires a significant military force protection, so it will become a strictly civilian mission." As the Harper government attempts an about-face on Afghanistan, Canada's future "training mission" isn't looking much like the promised quick march away from dangerous combat.